After the immensely successful Air Cargo Conclave and Awards 2018 held in December last year, Exim India Shipping Times is back with the 2nd Edition of the Air Cargo Conclave and Awards 2019 scheduled on Wednesday, 11th December 2019 at ITC Grand Chola, Chennai. Air cargo is on a steady growth path globally and in India. Growing e-commerce, improving air connectivity across small airports in the country and growth in GDP are expected to boost air cargo traffic in India in the near to immediate future. 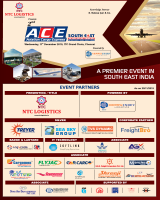 Given this context, the Air Cargo Conclave will see some of the top decision-makers from the Air Freight, Airlines, Airport and Express industries, besides policy formulators and regulatory authorities, participate in a wide-ranging deliberation on the issues pertaining to the sector in India and the world. New paths and innovative strategies will be explored to give a further fillip to air freight. The Conclave will be followed by a gala Awards Night which will honour and recognise the best companies and individuals who have excelled and made a difference through their distinctive performance and innovative thinking. With participation from the leading professionals and stalwarts of the industry, the glittering awards ceremony will truly be an event to remember. Thus, Air Cargo Conclave and Awards 2019 will be a definitive avenue for thought-provoking discussion and recognition of excellence in the sector.